This book provides a systematic study of three foundational issues in the semantics of natural language that have been relatively neglected in the past few decades. Chris Fox is a Reader in the Department of Computer Science at the University of Essex. 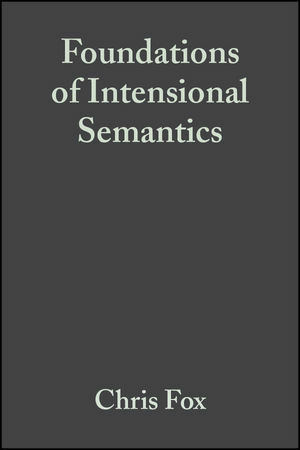 In addition to numerous papers, his previous publications in the area of computational semantics include The Ontology of Language: Properties, Individuals, and Discourse (2000). Shalom Lappin is Professor of Computer Science at King’s College, London. He has published extensively on issues in computational linguistics and formal grammar, and his books include Local Constraints vs. Economy (with David Johnson, 1999), Fragments: Studies in Ellipsis and Gapping (edited with Elabbas Benmamoun, 1999), and The Handbook of Contemporary Semantic Theory (edited, Blackwell, 1996). 1.2 Architectural Features of IL. 1.3 Structure of the Book. 2. Alternative Approaches to Fine-Grained Intensionality. 2.1 An Algebraic Representation of Possible Worlds Semantics. 2.2 Two Strategies for Hyperintensionalism. 2.5 Structured Meanings and Interpreted Logical Forms. 2.7 Situation Semantics and Infon Algebras. 2.8 Situations as Partial Models. 3.1 A Simple Intensional Theory. 3.4 PT: An Untyped Theory. 3.5 Intensionality in FIL and PTCT. 4. A Higher-Order, Fine-Grained Intensional Logic. 4.3 A Semantics for FIL. 5. Property Theory with Curry Typing. 5.1 PTCT: A Curry-Typed Theory. 5.2 PTCT: Syntax of the basic theory. 5.3 A Proof Theory for PTCT. 5.5 Intensional Identity v. Extensional Equivalence. 5.6 Extending the Type System. 5.7 A Model Theory for PTCT. 5.9 Separation Types and Internal Type Judgements. 5.10 Truth as a Type. 6. Number Theory and Cardinaltiy. 6.3 Number Theory in FIL. 6.4 Proportional Generalized Quantifiers in FIL. 6.5 Number Theory in PTCT. 6.6 Proportional Generalized Quantifiers in PTCT. 6.8 Presburger Arithmetic in PTCT. 7.1 A Type-Theoretical Approach to Anaphora. 7.3 Comparison with Other Type-Theoretical Approaches. 8.2 Comparison with Other Theories. 9. Expressive Power and Formal Strength. 9.2 Arguments For Higher-Order Theories. 9.3 Arguments Against Higher-Order Theories. 9.4 Self-application, Stratification and Impredicativity. 9.5 First-Order Status and Finite Cardinality. 9.6 Relevance of PTCT to Computational Semantics. 10.1 Montague Semantics and the Architecture of Semantic Theory. 10.2 Algebraic Semantics and Fine-Grained Alternatives to MS.
10.3 A Conservative Revision of MS.
10.4 Enriching Property Theory with Curry Typing. 10.5 An Intensional Number Theory. 10.6 A Dynamic Type-Theoretic Account of Anaphora and Ellipsis. 10.7 Underspecified Interpretations as _-Terms of the Representation Language. 10.8 PTCT and Computational Semantics: Directions for Future Work.